Football is kind of a big deal in our house….considering I’m outnumbered by my sweet boys. I do, however, look forward to the Super Bowl each February and am so excited to be hosting our neighbors for the game this year. Since the Pro Bowl was yesterday, we decided to do a little test run on our party supplies and had some of Bear’s friends over to “watch the game”, aka eat snacks and do anything but actually look at the TV. Which was fine, because we were fully prepared thanks to Bed Bath & Beyond. The boys had so much fun, I wanted to share some of what we did in case you’ll be hosting kiddos at your Super Bowl party, too! I needed some new serving dishes and wanted to order pieces I would be able to use time and time again, not just for one evening. I found this 2-tier marble server and cannot say enough good things about it. Not only is it beautiful for display purposes, but it folds up and lays flat so it’s easy to store. Win/win! We are on the hunt for a dining table for this space and I want to put this serving tray in the middle when we finally find it. The tray was perfect for holding all of our paper goods for the party, and can be used for so many things. Kids tend to make a mess with paper plates and napkins, so it worked well to have them sectioned off in a tray. I love the classic white and black detail of the tray and couldn’t believe it was under $30! Since our neighborhood is a circle with about 20 houses that almost all have children, we always have a crowd coming in to grab drinks from the refrigerator. I knew the adults wouldn’t want the refrigerator being slammed shut 200 times during the big game, but wanted drinks to stay cold if we set them out. We got this big bath party tub and it might’ve been our best party decision ever. This was perfect for the kids (and adults!) and I will use this in our pantry to store extra bottled waters. 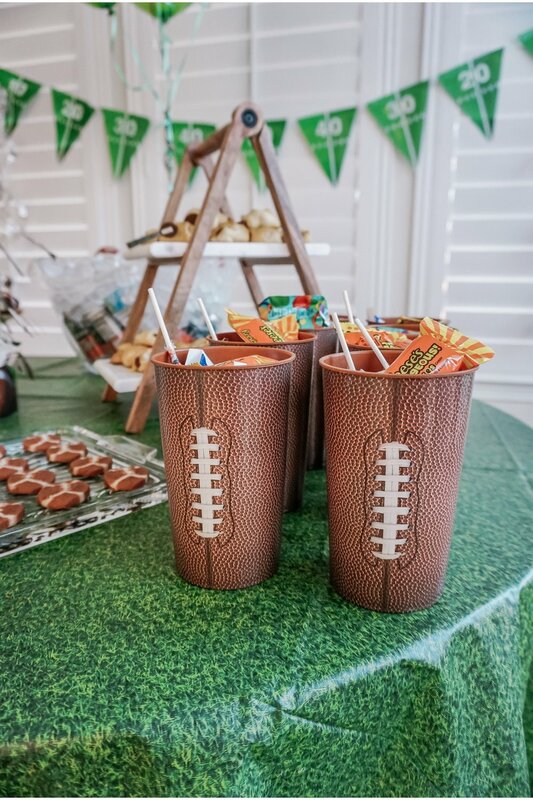 No party is complete without favors, so we grabbed these cups and filled them with cookies/candy. The kids loved them and felt special getting to take a treat home. Was also a great way to send home leftover cookies with our guests so we wouldn’t eat them all the next day. We wanted Boonester to feel like part of the party, so he got his very own silicone football grip dish. His high chair pulls up to the table and he’s always pulling his plate onto the floor, so this is a great way to keep his food on the table (and look cute in the process). Knowing Bear and his friends, I had a feeling they wouldn’t sit still for the entire football game. It makes it hard for the adults who do want watch the game to be able to do so when kids are running around screaming and going crazy, so we bought a fun board game to entertain the younger crowd. And it worked! I had never heard of 1st and Goal, but turns out it’s a really fun game that the kids loved and played for over an hour. Do you have big Super Bowl plans? Are you just in it for the halftime entertainment or do you watch the game? I’d love to hear! *This post is sponsored by Bed Bath & Beyond, however all thoughts and opinions are my own.